Halloween! What are we treating ourselves to today? 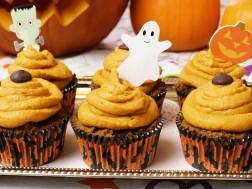 The kids and I whipped up these cutie (and healthier) Halloween cupcakes. This is what happens when our love for chocolate and peanut butter meet pumpkin! These cupcakes are bursting with antioxidants from the pumpkin and using a whole grain flour, such as brown rice flour, ensures plenty of nutrients and fibre are added to these treats. They are gluten-free, dairy-free and deliciously rich. Note: to make these nut-free, omit the frosting. The muffins are delicious on their own and make perfect snacks for the kiddies to bring to school. Optional – 1/3 cup dark chocolate chips, plus 12 extra chips for topping. Sift the dry ingredients and mix together in a medium sized bowl. In a separate medium sized bowl, whisk the eggs by hand (or with a mixer) and then add in the other wet ingredients until well combined. Add the wet ingredients into the bowl with the dry ingredients and mix, by hand with a spoon, until well incorporated. It may take a few minutes to thoroughly combine the batter. The final result will be a thick, dense consistency, that can be scooped, not poured. At this point add in the 1/3 cup chocolate chips if using and combine well with a spoon. Using two tablespoons, spoon the batter into 12 parchment-lined muffin tins and bake for 25 minutes until the tops are firm and when a toothpick, when inserted, comes out clean. Let them cool completely at room temperature before icing them (see recipe below). To ice these cupcakes, spoon the icing into a piping bag with a plain tip (or sealable plastic bag, with a small opening cut out of a corner) and pipe the icing onto each muffin. Top with a dark chocolate chip (optional), and enjoy! Combine all of the ingredients together in a small bowl.